Going into The Dandy Warhols show at the 9:30 Club on Wednesday night, I was skeptical as to whether the band and its frontman were going to put on a good show. My fears quickly abated, however, as the Dandys opened up slowly with “Be-In,” a slow psychedelic steamer from their second album. They then launched into the bouncier and synthier “We Used to Be Friends” from Welcome to the Monkey House, their fourth and best album. So even though the Dandys were on tour to promote a new album, This Machine, they weren’t about to disappoint their dedicated fans, who very nearly sold out the 9:30 Club that night, by neglecting their large catalog. The band tirelessly rolled through quite a long show actually, clocking about an hour and 45 minutes, losing some of their audience in the last 30 minutes only because they felt pressured to catch the Metro train home before it got too late. Although the band worked together remarkably well as a band, Courtney Taylor-Taylor carried the show with a jovial swagger. At times, he would evoke the grunge scene that he quickly grew beyond and mumble through some muddled lyrics and at others he would belt out his words clearly like he was channeling Iggy Pop. The Dandy Warhols soldiered through about 22 songs in total, starting out with a big focus on their back catalog with selections like the post-grunge straight-up rocker in “Not If You Were the Last Junky on Earth” and the hazy chantalong of “I Love You,” which brightens considerably at the end with Zia McCabe’s keyboards. Still, I much prefer their poppier songs to their neo-psychedelia and thus appreciated “You Were the Last High.” Indeed, my introduction to the Dandys was different than most others as I picked up the Nick Rhodes-produced Welcome to the Monkey House out of dedication to Rhodes and his bandmate Simon Le Bon, who made contributions to the album along with Nile Rodgers. Come to think of it, many people who receive a cursory introduction to The Dandy Warhols probably do so through the song “Scientist,” which was co-written by David Bowie and has been featured in the Mythbusters television show. In a sort of improvised intermission, Taylor-Taylor remained alone on stage while his bandmates rushed off to use the bathroom. “When you drink, you have to pee,” Taylor-Taylor shrugged. He played through a very well-received acoustic version of “Sleep” from third album Thirteen Tales from Urban Bohemia, which received a lot of play that night. When that song was not long enough to fill the void, Taylor-Taylor continued with “Every Day Should Be A Holiday,” another druggy crowd pleaser from the second album The Dandy Warhols Come Down. Taylor-Taylor was enjoying himself and this interlude solidified a solid rapport with the audience. So it also became a convenient opportunity to mention the new album after 11 songs and play the pretty strong first track “Sad Vacation” from This Machine. The band also got around to “Well They’re Gone,” the lead single from the album, evoking a slower more rambling version of “Last High.” Generally speaking the new album plays quite well and it’s perhaps the most straightforward collection of songs the band ever has put out. It shows a bit of country influences as well, as most of the band have been participating in country bands as side projects, most notably with a cover of Tennessee Ernie Ford’s “16 Tons” (which sadly was not played). The Dandys finished strong with songs like “Bohemian Like You,” drawing a wildly enthusiastic reaction from the tired crowd, which had stood through about 18 songs at that point. The band powered through it and sounded great, eschewing some of the muttering and shoegazing Taylor-Taylor bought to some earlier selections. Overall it was an impressive tour through an uneven catalog where the dance songs carried the day for me over the slower psychedelic ones. 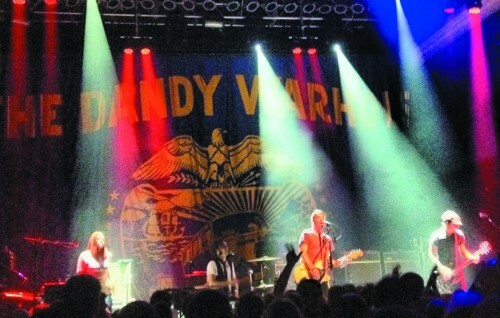 The Dandys came with two opening bands, both of which did their part to sent the tone of the overall concert. 1776, an incredibly polite four-man group from Washington state, were a straight up rock-n-roll band with a bit of blues and a bit of punk. They release a debut album on June 5 and a second one is already in the works, according to their lead singer. Rock songs like “I Won’t Be Your Prey” reveal their influences in garage rock a la The Rolling Stones. The second band up was the Psychic Ills, a thoroughly psychedelic five-member band from New York City. They had a good heavy hazy sound that filled a long set of about 45 minutes. They presented pure polished psychedelia and actually hypnotized the half-full club into respectful silence with their music. Their actual performance was a bit dull though as only bass player Elizabeth Hart showed any tendency to move around at all, leaving the male guitar players, drummer and synthesizer player in largely fixed positions. The show was a strong outing for The Dandy Warhols, who should be seen on this tour if you haven’t seen them in a while or at all. You’ll surely remember why you liked them in the first place. A great review of a great band. i question whether the dw’s ever played the alantis. i am almost certain the alantis became the 930 in late ’79. i am also almost certain that there was never a basement stage. i remember a basement. that might have been where the coat check and bathroomks were.